Aiseesoft iPod to Computer Transfer is a quite simple and useful iPod backup tool for you to transfer iPod music, movies, camera roll, pictures, voice memos, and camera shot to computer without iTunes, and there is no need to worry about losing anything. Moreover, this transfer fully supports all iPhone/iPad/iPod devices, including The New iPad, iOS 5.1 and iTunes 10.6. Key Functions 1. Backup iPod files to PC Aiseesoft iPod to Computer Transfer can assist you to copy iPod music, movie, camera roll, picture, voice memos, and camera shot files to your PC without using iTunes. 2. Preview your files It enables you to preview the video and picture on your iPod. 3. Show all iPod informations All iPod info, including picture, type, capacity, version number, serial number, and format, will be clearly shown on the main interface. 4. All iPod/iPhone/iPad types supported Supported devices: iPod 1G, iPod 2G, iPod 3G, iPod 4G, iPod classic, iPod mini, iPod nano 1, iPod nano 2, iPod nano 3, iPod nano 4, iPod nano 5, iPod nano 6, iPod shuffle 1, iPod shuffle 2, iPod shuffle 3, iPod touch, iPod touch 2, iPod touch 3, iPod touch 4, iPod Video, iPhone, iPhone 3G, iPhone 3GS, iPhone 4, iPhone 4S, iPad, iPad 2, The New iPad. 5. Easy to learn This iPod transfer owns a simple and easy to userstand interface, you can learn how to use it by yourself without any trouble and confusion. 6. Transfer your files fast Transfer your files with super fast speed. It can save you more time to enjoy your movies and music on your iPod. SWF Player for Mac is a smart and easy - to- use free Flash Player to playback and manage your SWF and FLV files. Free Video Cutter is a free video tool to help you split and cut large video files to small files, it can work with most video formats,released as freeware from FreeVideoCutter.com, completely free for every video fan. Easy video publishing for small businesses, web designers, advertising professionals, online educators and video bloggers... Desktop application that runs on your Mac or PC. 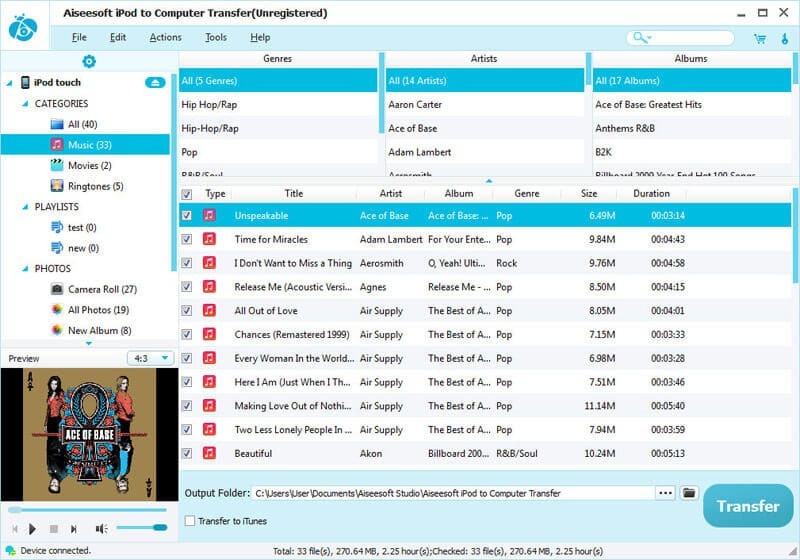 AVI To MP3 Converter is a very easy to use conversion software. It can convert almost any file with AVI extension. This site does not contain serial number, crack, keygen Aiseesoft iPod to Computer Transfer serial number : serial number is the simplest type of crack. A serial number(cdkey,product key,etc) is register the program as you may already know. a crack or keygen may contain harmful software. If you cannot find the exact version you want, just give it a try. for more information read .nfo/.txt/.diz file include in zipped file.